Is your facility in compliance with the New Jersey PAD Law? 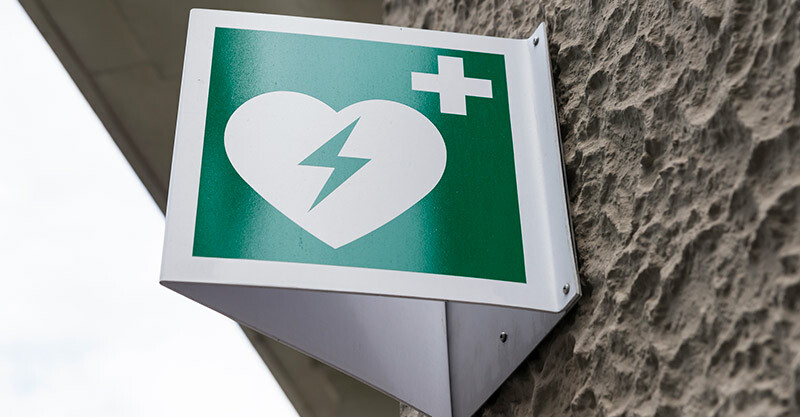 While many New Jersey companies have heard of the NJ Public Access for Defibrillation Law, there is still some confusion as to what it means or how to be in full safety compliance. If your site has an AED, it is important to make sure that you have the CPR training, as well as a fully active NJ AED compliance program. While AEDs are easy to use, it is crucial to have a team in place that has been properly trained and certified in CPR and AED. While it might seem like a good idea to send a couple of employees to the local CPR class to become certified, a more effective route to consider is to having your entire staff prepared to respond to a cardiac crisis. A decision to have your CPR/AED training at your New Jersey business location will help prepare your employees for a team emergency response. At EMC CPR & Safety Training, we bring the classroom to you. Learning how to perform CPR is quite simple with a skilled NJ CPR instructor. We can provide training at your location to allow your staff to learn what emergency steps to take in the environment in which they are expected to respond. In addition, we can make sure that you are in full compliance with the NJ PAD Law; including have the proper CPR certification and full AED management and oversight. To inquiry about a CPR/AED business training package, submit in inquiry online to call us at 800-695-5655. Please see below to read the full NJ PAD Law. An Act concerning certain emergency medical services and supplementing Title 2A of the New Jersey Statutes. 1. The Legislature finds that more than 350,000 Americans die annually from out-of-hospital sudden cardiac arrest. Many die needlessly because lifesaving defibrillators are not immediately available. The American Heart Association estimates that almost 100,000 deaths could be prevented each year if defibrillators were more widely available to designated responders. Many communities in this State have invested in 911 emergency telephone equipment, ambulances and the training of emergency personnel. Not all emergency personnel, however, have been trained in or have immediate access to defibrillators. It is the intent of the Legislature to encourage greater acquisition, deployment and use of automated external defibrillators by trained personnel throughout this State. c. Upon determining that defibrillation should be performed, automatically charges and requests delivery of an electrical impulse to an individual’s heart. d. Prior to purchasing the automated external defibrillator, provide the prescribing licensed physician with documentation that the person or entity purchasing the defibrillator has a protocol in place to comply with the requirements of subsections a., b. and c. of this section1. 4. a. A person shall not use a defibrillator unless he has successfully completed 1[a nationally recognized training program] and holds a current certification from the American Red Cross, American Heart Association or other training program recognized by the Department of Health and Senior Services1 in cardio-pulmonary resuscitation and use of a defibrillator; provided however, this section shall not be applicable to a person who is licensed as a paramedic, emergency medical technician-D, or a first responder-D by the Department of Health. b. Any person who uses a defibrillator shall request emergency medical assistance from the appropriate first aid, ambulance or rescue squad as soon as practicable. 5. a. Any person or entity who, in good faith, acquires or provides a defibrillator, renders emergency care or treatment by the use of a defibrillator or supervises such care or treatment and, who has complied with the requirements of this act, shall be immune from civil liability for any personal injury as a result of such care or treatment, or as a result of any 1[act or failure to act in providing or arranging further medical] acts or omissions by the person or entity in providing, rendering or supervising the emergency care or1 treatment. b. The immunity provided in subsection a. of this section shall include the 1[supervising licensed physician and the] 1 2prescribing licensed physician and the2 person or entity who provided the training in cardio-pulmonary resuscitation and use of the defibrillator. Our lively CPR/AED classes engage learners with hands-on training and equip them with the knowledge, skills, and confidence necessary to respond to sudden cardiac emergencies. Our CPR/AED classes in New Jersey prepare staff to perform CPR and use an AED on adults. Let EMC handle the details of your facility’s emergency action plan, so you can save yourself time and stress as well as feel confident knowing that your facility is in compliance with NJ PAD Law.